India is certainly basking in the glory of its ancient scientific achievements. Starting from the discovery of the “zero” to the “first” flight, the high and mighty in the political leadership have added a certain curiosity to the otherwise dull National Science Congress. 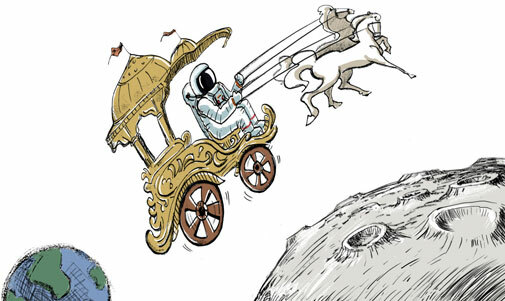 Suddenly, the image of ancient India emerges as an “impeccable scientific super power”. But it is also contradictory. The same political leadership interestingly refers to contemporary India as an “emerging soft power”. This magazine has been an ardent chronicler of the history of science and ecology, and innovations in both the Indian and global context (recently we published a book called Environmental History Reader). Its founder editor, the late Anil Agarwal often lamented about science being a political orphan in the country. So, should we celebrate the new-found focus on science in the political space, no matter how nationalist and unscientific it is? No, because the debate is selective in its focus. And more importantly, it is not a scientific debate over the history of Indian society’s scientific evolution. I emphasise that science is definitive and its use is always political. But the current debate on claiming each and every bit of contemporary day-to-day technology or knowledge as “Indian” is not political. Rather, it is more of a certain type of cultural and religious propaganda. The ongoing debate over scientific ancient India has objectives that are diametrically opposite to science and its day-to-day uses. This is where science loses its political meaning. The claims of scientific genius in ancient times are mostly about what people popularly call “muscular” science. And it is no surprise that in most of such claimed superlatives, contemporary India is grossly behind other countries. It is a cultural “feel good” phase in India that incidentally used science. At the same time, the political leadership never speaks about the ancient scientific knowledge that dictated our tradition and culture but seemingly without the muscles that the current world order recognises. For example, no politician from Rajasthan speaks about the scientific knowledge that made possible the most densely populated desert in the world. But the state politicians still take pride in hosting India’s nuclear weapon-testing site. A politician who belongs to Uttarakhand even claimed that India exploded a nuclear bomb early in history. He forgot to take pride in his state’s traditional wheat mills using streams that are now being used to generate electricity. There is no doubt that ancient communities were scientific enough to master the art of living off the Earth’s most precious natural resources. They codified science in their ways of life like domestication of rice or innumerable foods that ensured food security. But when a debate that selectively and without scientific codes flexes muscles, a society suffers the most. No society can survive without some scientific temper, but the current debate ignores this aspect. It is trying to segregate science on cultural and to some extent religious basis. Science is being projected as the knowhow of only those things that yield some cultural superiority. This brings the debate to the moot point: whose science should we focus on? "It is trying to segregate science on cultural and to some extent religious basis. Science is being projected as the knowhow of only those things that yield some cultural superiority." -There is already a term coined for this purpose: Lysenkoism. Russians once firmly believed that they were indeed Homo sovieticus and not Homo sapiens. Science, as is generally thought of by us Indians, is something which was evolved in the west by the westerners. The names of Galileo and Archemedes are well known to us, Kannada and Vachaspati are rarely beard of. And yet, the truth is that the very foundations of science in all its different branches were laid by orientals, to which our ancestors always contributed the lionÃ”Ã‡Ã–s share. In the light of the manifold advancements in different sciences made by our forbears, and in keeping with the present day revival of the spirit of nationalism, it is necessary that a proper and authoritative compilation of the history of science and scientific activities in ancient India be made, either by the Government or by the Universities. Such a history should be taught, side by side, with western histories, in our science classes particularly. Ã”Ã‡Â£There has been a very large increase in the number of History of Science courses being offered in Institutions of Higher learning in the united States, and the number of Institutions offering such courses has rapidly multiplied. Today some 70 colleges and universities in the United States offer lectures in the History of Science. The appearance of such courses in educational institutions has in turn produced a demand for Professors of the History of Science that has far outstripped the supply. This demand, in its turn, has stimulated the development of programmes of education directed at producing teachers of the History of Science. The doctor of philosophy degree for students working in the History of Science is now being offered at a number of institutions, including the University of Wisconsin, the University of California, Princeton University, Cornell University, Yale University, Harvard University, Indiana University and the University of OklahomaÃ”Ã‡Ã˜. Page: 59, MY EXPERIMENTS IN SCIENCE: WITH SPECIAL REFERENCE TO APPROPRIATE TECHNOLOGY,Monograph,Dr.A.Jagadeesh,1977. no matter from where it comes,ultimate goal of science or religion is only to provide best and peaceful way of life is the point to be remembered and to be imprinted on minds..